Optimised website content drives online success, by accurately informing your target audience & endorsing your digital marketing plan, whilst at the same time boosting organic Search Engine Optimisation (SEO), i.e. matching website copywriting/content with meta-tags such as page keywords, titles, descriptions, as well as relevant reciprocal links. This is what organic Search Engine Optimisation (SEO) is all about & what truly boosts search ranking. Organic SEO? What's Search Engine Optimization & how should it be adopted to web development & digital marketing. What's Organic Search Engine Optimisation (SEO)? Search Engine Optimisation or Optimization (US), known simply as "SEO" is without doubt the new buzzword of the website & Internet technology information era. And rightly so. Organic Search engine optimisation (SEO) is all about making your website rank highly in search engines, as well as increasing its overall presence online, i.e. ranking more often. Since so many are now using search engines and the Internet to locate whatever they are looking for, SEO ultimately increases your company's/organisation's exposure to potential markets/customers. Indeed, search engines are what the vast majority of Internet surfers use as a starting point to locate a particular website. In fact, so many people use it nowadays to even just link to a website they already know and visit regularly. Thus, your website must rank (appear) highly in search results in order for people to find it. SEO is the process of affecting the visibility of a website in a search engine's organic (un-paid, as opposed to paid advertisements in search engine marketing) search results. SEO may target different types of searches, including textual image search, local search, video search, academic search, news search and industry-specific vertical search engines. As such, all types of web content influence search results, and should in turn be specifically customised to do so. As part of an overall Internet marketing strategy, SEO considers how major search engines operate, i.e. how their robots/spiders crawl website content and deliver search results, as well as what people are searching for, i.e. actual search terms, phrases and keywords typed into search engines. "SEO is very much focussed on 'Internet Psychology', understanding and evaluating how Internet users think and operate when searching for something online. To achieve best results, you must understand a range of relevant fields, including: how search engines operate, how a website is built, writing web content, business, marketing and communications, analysing website traffic trends, and how website surfing is normally conducted. Web-Conceptions bring all of these aspects to the fold." Stay Competitive What's the point in having a website if no one can "search" & "find" it easily online. SEO improves visibility. SEO competition is fierce. Indeed, everyone is fast discovering the importance of SEO, SEM (Search Engine Marketing) & Digital Marketing. So many companies/organisations are investing huge amounts of resources (time, money & personnel) to achieve optimal search results, attempting to optimise and boost their website's search ranking and online presence. As such, you must also try to stay competitive and adopt SEO elements to your website, otherwise you will fall behind. Optimising a website may involve editing web content, HTML/code and associated coding to both increase its relevance to specific keywords and to remove barriers to the indexing activities of search engines. Promoting a site to increase the number of backlinks on third party websites and portals, or inbound links, is another important SEO tactic. Techniques focus on areas such as website copy content, meta-tags (keywords, descriptions, titles), proper repetition of key words within content, back-links and more. Certainly all of these are important & essential components to achieving good SEO. Remember, ideally SEO should make your website appear more often in search results of what terms, phrases and keywords the majority of people in your market are actually already searching for online to find your products/services, and not simply you company's name - if they already knew your company name then they it wouldn't be so necessary to conduct a generic search. For example, if someone is seeking a web developer and SEO services in Cyprus, naturally they will type "web developer and SEO in Cyprus" and not our business name "Web-Conceptions". Thus, we would want to rank highly with the phrase "web developer and SEO in Cyprus" - incidentally, www.web-conceptions does rank in the top page of Google with this search phrase! I would say that's great proof of our abilities. Of course the higher your website ranks with both targeted and generic search terms, phrases and keywords, the more visitors it will receive and in turn the greater exposure and potential for increasing business activity. SEO should be performed early in the website development process, following in depth research for concept design, content writing, URL design phase, and even choosing the right domain name. You can never guarantee search engine results; anyone that tells you otherwise is simply not right, so be aware. However, adopting search engine optimisation strategies will certainly improve your website's chances. SEO is an on-going process: at Web-Conceptions, we say 50% of the work is done in the actual website development process. Assessments and modifications over time, together with a wider digital marketing campaign (i.e. social media, online PR, CMS component, SEM) is required to deliver the best ranking and online presence results over the long term. Don't forget, web development is not only about SEO and ranking highly. Once someone visits your website, you want to keep them there, and bring about some sort of call-to-action/conversion, i.e. purchase your product/service, subscribe, etc. So when building a website and integrating SEO, consider aspects such as aesthetics, functionality, navigation logic, practicality, as well as overall marketing concept. Indeed, the greater your relevant traffic, the greater chance of success; in SEO and overall online. SEO Don't Do Only recognised strategies should be adopted to improve search engine ranking. Bad techniques harm a site. There are many SEO ideas which in theory might seem good, but in reality do not work so well and in fact harm your website's search ranking - and even be downgraded by search engines. For instance, attempting to get keywords words in a website as much as possible - flooding website content with only keywords. Take this site, Web-Conceptions.com. The aim is to rank well whenever someone searches something along the lines of "web designers and developers in Cyprus", "website concepts and brands in Australia" or "website and SEO service in France". So, start writing and flood the website with the words SEO, website, designers, developers, Cyprus, Australia, France. Other websites might try to do the same thing, relative to their industry/market. But it is not as simple/easy as this. This is keyword overkill and search engines do not look favourably on this. Website content must make sense and be presented in a sensible manner. Thus, be clever and honest in the website development and web content writing approach. It is not as simple as repeating keywords in website copy. Never build a website full of textual content and then flood it with keywords. The website will of course look ugly and make it hard for viewers to follow, read, comprehend and actually follow through with some sort of cal-to-action. This will also not achieve the mission of being informative. Most visitors will simply be scared away within seconds and leave the website. The same holds true with links. Don't bother flooding the website with irrelevant links. It serves no purpose & just makes the website hard to navigate. Build a fantastically-looking design & then flood it with hidden content and key words. Whether this is in a page with no apparent passage way link, somewhere very well hidden, or in a colour hard to see. Again, a major "No No". Search engines will not like you website & will in fact abandon it. Do not copy your website's content from other websites, or even form your own. Research is research, and of course we all use the Internet now for conducting research - Intertexuality is very common within the media and all forms of communication channels. But be original and creative, always focussing on your specific purpose and keyword analysis. Copying other text will steer your content away. Hence Web-Conception's great competitive advantage and inspiration - that all website content is written by professional marketers and creative writers with extensive experience in website copywriting, SEO practices and international business. Duplicated content is also very bad practice. Search engines downgrade on seeing duplicated website content as well as also meta-tags. So do not copy content in your website in multiple web pages. Keep each page unique. Do not use keywords and content that is very general. The goal is to stand-out. Sometimes you cannot avoid this, but try to be as creative as possible and a trend-setter, instigating a new approach to exposing your website. This all happens in the development of your overall concept and brand; unique and creative. Of course also keep in mind what your target audience will be searching and try to find a balance. Additionally, purposely generated editorial and paid advertorial links are a fine line, as are links with optimised anchor text in articles or press releases and forum and blogging-type links within content and in the signature. The best method to build links is to be honest in your approach. Focus on creating high-quality and unique content that naturally gains popularity in the Internet community whilst encouraging other sites to post relevant links and references to your site. So again, Content is SEO KING. Market Research Provides important insight information to identify & analyse market need, market size & competition. Provides important insight information to identify & analyse market need, market size & competition. Insights: market research should be considered the foundation of any form of marketing communications, and even the wider business field. Market research is an organised effort to gather and interpret information and trends, allowing one to better understand their industry, customers (target market and emerging/potential market), as well their product/service and where it fits on the marketing matrix. Being better informed certainly puts you in a much better position to formulate, plan and execute a business strategy, both on- and offline. Indeed, market research is a fundamental factor to maintain competitiveness over competitors and improving success rate. It allows you to define your overall business strategy, both on- and offline. It allows you to design and develop the most appropriate website, as per market requirements. It allows you to adopt the most suitable ongoing digital marketing campaign, increasing online presence and driving greater traffic. "In-depth Market Research should always be conducted before attempting any form of Search Engine Optimisation and Digital Marketing." Benchmark Knowledge is power. Competitor analysis & benchmarking during website & SEO development process. Knowledge is power. Competitor analysis & benchmarking during website & SEO development process. Benchmarking is the process of comparing one's business processes and performances to industry bests or market relevant competitors (direct or indirect competitors) in order to gain vital insights and information - sometimes from other industries where similar processes exist. Areas that might be typically measured include quality, price, products, services, and execution, among many other and then comparing these to one's own results and processes. By doing so, it evaluates their processes in achieving success, and then allows organisations to develop plans on how to make improvements or adapt specific best practices in order to increase various aspect/s of performance. In the case of web development, search engine optimisation and digital marketing, benchmarking is more or less comparing direct and non-direct competitor websites. This is vital to understanding how competitors and industry leaders have approached their online strategy, and what current search engine (and online) positioning they've achieved. Knowing this would not only provide and drive interesting ideas/innovations, but also put you in good stead to better develop and optimise a website to perform better in search engines. Benchmarking should always be conducted prior to starting any website development and/or SEO project; it is part of a wider research and analysis phase. Benchmarking should be an ongoing process, as markets and competitors change. Competitors online are not simply those that compete in selling the same product or service as you. When competing for ranking and traffic in Google, non-direct or perhaps even neutral websites are also in the mix, such as media, publishers, blogs, affiliates and in particular portals. You still want to rank higher then these websites! Take regular action on what insights benchmarking reveals. Just because someone is a competitor in search engine ranking, that does not mean you can not work together an form an alliance, whether that means a affiliation programme, link-exchange or even paid advertising. Consider portals; they compete with our website on ranking, but you can still place a directory listing and add on their site. This then helps your own SEO cause, as well as boosting general online presence. Important: Don't get stuck on what competitors do and simply try to copy and outdo all the time. Take what insights you can from a variety of source - even outside your market and industry - and then integrate this with a wider internal strategy. Focus on being proactive! "Take ideas, take inspiration, but always attempt to be unique, and a trend setter. Focus on your own Unique Selling Proposition (USP) and unique online positioning." Keyword Analysis Research both high priority & low competitive key words; fundamental when developing a website. Research both high priority & low competitive key words; fundamental when developing a website. Keyword analysis is the research and evaluation of what words, terms and phrases Internet users are entering into search engines when conducting a search query. It is a kind of forecasting method in order to uncover the various word-, term- and phrase-possibilities you can focus on in your website, of course relevant to your specific goals, products/services, market and audience. It is safe to assume that such keywords will be standard in most search engines, since it is more about the psychology of people's behaviour in searching than an actual tool or search engine vendor. These key words must then be integrated within your website development and ongoing digital marketing strategy, i.e. within website content, meta-tags, and paid search engine marketing. "Although it is absolutely essential that a website integrates a good amount of high priority key words, it should also forecast and think fourth dimensionally. In other words, consider what the future might hold, and that your website might in fact help dictate what people search." Content Copywriting With SEO, CONTENT IS KING. Thus, a writer will help you achieve ranking & not a web designer. With SEO, CONTENT IS KING. Thus, a writer will help you achieve ranking & not a web designer. Website content is what truly improves SEO and drives search ranking results! It is your website's content that will ultimately be crawled by search engines, reviewed and ranked accordingly. Market, competitor and key word research are all simply groundwork in order to write proper website content and thereby increase the chances of achieving high search ranking results. As such, it is actually a writer, and ideally one from a business, marketing-communications and digital background that will achieve SEO; Not a web designer. Indeed, the Internet has expanded the copywriting field, to now include web content, electronic ads, emails, blogs, social media and other forms of digital communications. Writing for the web is quite different to writing for other media, tending to be more succinct than traditional advertising, and of course must have an understanding of search engine mechanics. Content copywriting for websites ultimately attempts to achieve higher ranking in search engines - otherwise known as "organic" search engine optimisation. This practice involves the strategic placement and repetition of pre-researched keywords, terms (jargon) and phrases on web pages, yet writing in a manner that is concise, makes sense and would read as normal. Such writing applies to not only website descriptive text, but also headlines/titles, sub-heads, captions, link texts, navigation links and various forms to calls to action - search engines give great weight to keywords, terms and phrases in these areas. However, a website content writer can not simply go all out to achieve high search ranking by flooding web pages with keywords scattered in meaningless sentences. Web content must be balanced, and consider normal reading behaviours, i.e. read well and make sense (as well as be informative and explanatory), therefore drive visitors to some sort of desired call-to-action, i.e. buy the product/service, subscribe to the organisation, download, etc. "Consider that the art of writing website content must balance creative copywriting, technical writing, business analyst, market research, marketing communications, an understanding web design and development, as well as best search engine optimisation and digital practices. This is exactly what we offer." Meta Tags Page data tags including keywords, descriptions & titles that tell search engines what your site is about. Page data tags including keywords, descriptions & titles that tell search engines what your site is about. Most major search engines use meta tag information when building their indices (search rankings) and deciding the relevancy of a website. Officially, HTML meta tags are page data tags that lie between the open and closing head tags in the HTML code of a website document which are read by search engine robots. This then helps search engines identify important key words in a particular page and rank it accordingly (of course also factoring in many other elements within their algorithms). Ideally, each page should have separate meta tags, as well as remain with given search engine parameters. Using a CMS website, you should be able to add your own meta tags. When developing a complete website, your web developer/programmer will do this. Unlike normal HTML tags, meta tags do not affect how the page is displayed, but rather provide information about a web page. Meta tags explain the particular page so a browser can understand what it is. Information provided includes who created the page, how often it is updated, what the page is about, and which keywords represent the page's primary content. The title and description meta tags do however appear in search results, and help persuade people to click through to the website. The various words in each of the title, description and key word meta tags should also appear in your web page content and of course relevant to what your website is all about. Want top search engine rankings? Adding meta tags and keywords to your website and it will magically rise to the top? Wrong. Meta tags are definitely not a magic solution to gaining search ranking. They are only one piece of a large algorithmic puzzle that major search engines look at when evaluating which websites are most relevant. However, meta tags will help tell search engines as well as website users what your site is about, and which words within the various web pages are primary. They should also be implemented as correctly as possible; i.e. not too short or long, accurately describing the relevant web page, and avoiding key word repetition. Think of meta tags like telling search engines which exact words within your content you consider to be most important, as well as an opportunity to offer a small advertising blurb in search results. When someone searches for a website in Google for instance, they will surely read the (blue) title & brief description of the search result. These days there are literally millions of search results that appear. Only the eye and user can truly filter which website is most relevant. "Each page has different content, so each page should also have unique meta tags. Try and find a balance when putting together meta tags, between using your page keywords together with what you want to express." Design Structure User-friendly & logical design, together with static content-based structure improves SEO & digital marketing. Although by name alone, web design structure/architecture might not appear to be one of the standard tools in search engine optimisation, however it is in our view one of the most important. It is also a key element to sustaining website traffic, keeping visitors on your site and ultimately driving conversions. At Web-Conceptions we actually believe it is the secret to our SEO success, and one of our primary competitive advantages over many other web designers and developers in our markets. A custom-build website significantly boost search engine ranking. A lot more than most website designers and developers actually give credit, or perhaps intentionally ignore it due to operational and financial perspectives. You see these days, most web developers implement some type of ready-made "CMS", such as WordPress, Joomla, Drupal, Magento, among many other, as it is a more efficient method of building a website and maintaining website content. However, this then takes away a lot of power in SEO abilities, as it makes it somewhat harder for search engines to crawl (search and find content in the database), and poses a number of other strategic limitations. In contrast, building a website with a predominantly static content-based structure takes more effort in coding and content. However, this effort is repaid tenfold in a much more SEO powerful website. Of course, the site should also be user-friendly & logical in navigation, as well as aesthetically creative and appealing. It is like mass produced products on an assembly line compared to custom-build, hand-crafted items; quality and performance. Which would you prefer, especially if the latter is actually even cheaper? This is what we're all about at Web-Conceptions. A predominantly static content based website structure is much more powerful in terms of SEO, as it allows search engine robots to crawl (search and find) website content much more easily - as opposed to most ready-made CMS-built websites. No doubt, CMS-built websites have their benefits, namely that all website content can be managed via a backend, and this might very well suit your requirements. However, this is also its pitfall in SEO. Ensuring a website has an aesthetically appealing design structure, together with logical and practical navigation, i.e. user-friendly. This makes sure that when a visitor enters the website, they like what they see, find it easy to surf around, stay there and ultimately respond to the desired call-of-action (buy your product or service). With this, one must also now factor in responsive websites. Responsive websites improve the user experience on various devices, as the design structure "responds" and adjusts website dimensions automatically according to device size/resolution. This applies mostly for mobile devices. "At Web-Conceptions, we do not use ready-made CMS platforms. Indeed, we spend a lot more extra time and effort building and testing mostly static content based websites with fully customised CMS components as per what the client really needs. This then is our competitive advantage, as it significantly boosts search engine ranking." Website URL Proper URL structure plays a major role in how the pages are indexed by search engines. Proper URL structure plays a major role in how the pages are indexed by search engines. It is a lot more valuable to utilise URL extensions with relevant key words. So, instead of using generic URL extensions (file names), its much better to label each file with a descriptive name that includes your target keyword/phrase. Multiple words should also be separate with dashes, rather than underscores, as the search engine spiders may interpret words separated by underscores as a single word (as in, the file name "website_services" might be read as "websiteservices" to the search engines in some cases). "We do not leave anything to chance when it comes to Search Engine Optimisation. We focus on every little white-hat (recognised and allowed) aspect to improving search engine ranking, as well as always try to think of new creative ways to boost a website's exposure online and stay ahead of competition. It's our passion, profession and specialisation." Domain Name Selecting the right website domain name can truly benefit search ranking in many ways. Selecting the right website domain name can truly benefit search ranking in many ways. Essentially, a domain name is your website's address on the Internet. If you don't already have one, selecting the right domain name for your website can actually benefit your search engine ranking cause. When selecting a domain name, careful consideration must be given to the overall concept and positioning of the website, ensuring it is in line with overall marketing strategy, as well as SEO priorities. It should also be suitable for your intended market. The main task is to boost you domain name's credibility. Some choose to have a more obscure, generic and catchy domain name. Usually, if the brand is already somewhat established (like some of the mega multinational brands), then online credibility and ranking should already be quite good. If not however, then it might be a good idea to choose key words in all or part of your domain name. Of course any domain name can be made to rank well if all other SEO and Internet marketing strategies are adopted. Whatever domain name you choose, the more effort you put into digital marketing and online branding, the greater the chances of SEO success. Make sure the domain name you select is not already badly listed and downgraded in major search engines. Some domain names have built a reputation for spamming and black-hat (bad) SEO techniques. Research your domain name well with all major search engines (such as with Google webmaster tools) or ask an expert SEO consultant in order to avoid using such bad domain names. URLs help in SEO, so ideally your domain name will have all or part of your targeted key word/s. A domain using key words would naturally be referred to within website content more often, boosting the chances of ranking organically with such key words. If a generic domain name is chosen, focus a lot more on digital marketing to inform the market and create the online buzz on our name. "The process of selecting a domain name is both artistic and logical. It incorporates knowledge of SEO, experience in copywriting, together with business and market intelligence. At Web-Conceptions, we help clients select a domain after conducting all preliminary business and market research and during web content copywriting." Website Links If Content is King in SEO, then hyperlinks are servants, networking the SEO purpose. If Content is King in SEO, then hyperlinks are servants, networking the SEO purpose. Together with content, back-links are commonly known to be the most important aspect of search engine optimisation. In the very beginning they were 'the' most important, as it boosted a website's network reach. Think of it like this: when search engines crawl the internet looking for website content that matches the keywords and phrases entered into a search query, they also crawl via external links on third party websites. Therefore, having your website's link on many other websites multiplies the chances of search engines searching and finding your content. However, these external websites should also be relevant, i.e. from the same industry, and having content that is relatively similar to your own website's content. For instance, a website for an eco-friendly chauffeur service in Melbourne, Australia should much rather have their website's link on say the taxi association of Melbourne and Victoria, VHA and Taxi Associations, and Eco-organisation Greenpeople.org, then say a website that sells computers. The former would share similar key words prospective clients would be searching, such as "taxi", "VHA", "eco-friendly", "chauffeur", and "Melbourne". The later almost none. It is also far more superior if these external websites have powerful search engine credibility. A link on a government institution or recognised multinational cooperation would no doubt do wonders for your website's credibility and therefore ranking. By the same token, if links are on non credible sources they can harm your site's ranking, as they are considered to be unnatural and link-spam. So get networking online, build relationships and start link-sharing on other relevant and credible websites. This is vital to boosting your website's search engine ranking. Your website's link should be on other relevant websites, i.e. containing similar keywords within their content and meta tags. It helps if these other websites are also already ranking well & have themselves many other links to and from their website. Hence why specialised portals are so popular. Focus on very credible websites, as this improves your own site's credibility to search engines. Don't think link-building is an instant process. Build your network by building relationships over the long term. Even if it takes one year and more to get your link on a high-ranking and very credible website then it is still very worth it. It is always courteous & a good idea to offer a return (reciprocal) link back to the website that has yours link. Some say this does not actually help your ranking, but Web-Conceptions beg to differ. It is the right thing to do, & actually can boost your ranking even further, as search engine crawls go back-and-forth & return to your website! Like content, presentation is crucial. No good in clogging up your website with links. They must be presented well, clear, easy to read and in the right place. Consider RSS and XML feeds, as they are a powerful SEO tool. These work somewhat like links, connecting your website to other sites; feeding from their site or seeding to their site. RSS also of course have many other benefits, such as for content purposes, dynamics & regular 'live' updates, such as with news. "At Web-Conceptions, we always kick-start clients with some link-building work and then offer them direction on how best to continue. We want their website to achieve the best possible exposure and search engine ranking." Marketing Incorporating both free SEO techniques & paid online advertising, SEM boosts Internet visibility. 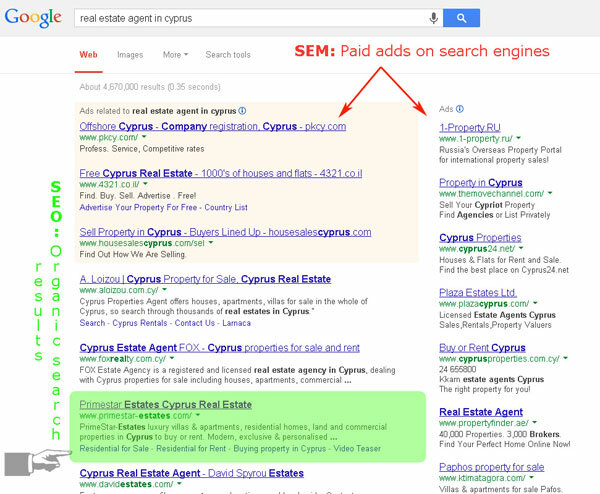 Incorporating both free SEO techniques & paid online advertising, SEM boosts Internet visibility. Paid search engine advertising placements and pay per click (PPC) or sponsored listings, utilise either major search engines such as Google, Bing and Yahoo, social media marketing (SSM), such as Facebook and Youtube. SEO is in many ways like Public Relations; attempting to generate free and more credible exposure - although in reality there is cost and resources in carrying out such a task. SEO is however generally perceived to be more genuine and relevant to the end-user, i.e. an advertisement in a newspaper compared to an article. SEM paid advertising is more like traditional advertising; and a lot more controlled form of online marketing - more direct, targeted and measurable. Just like in traditional media, it is indeed beneficial to consider both strategies in an overall SEM and digital marketing campaign, but each evaluated depending on your goals, market and industry. Research and keyword analysis is needed for both SEO and SEM, whilst both also need to be monitored and updated frequently to reflect evolving best practices and a changing market. Finally, it should be noted that although paid inclusion is a search engine marketing method in itself, it is also a tool of search engine optimisation, since websites can see instant results, measure performance, and then test different approaches to improving ranking with other SEO aspects. So many would use paid adds in search engines to generate feedback, analyse results and then act accordingly to benefit organic search ranking. "SEO should always be the foundation of your website's search ranking and online credibility. Meanwhile, SEM is a great tool for further boosting online exposure, targeting specific markets, and measuring results." Marketing & SEO Social media has become a major platform for Internet marketing - SEO/PR & Advertising. 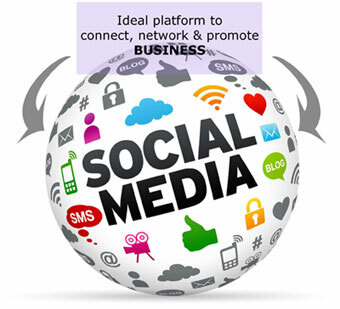 Social media has become a major platform for Internet marketing - SEO/PR & Advertising. As the term suggest, social media is a type of media platform that enables more general everyday social interaction. Social media has become a forum for information exchange, open to the public (or selected groups). It differentiates from traditional media in many aspects, such as quality, reach, frequency, usability, immediacy, and permanence. Internet users throughout the world continue to spend more time and effort on social media sites; as so many social media are now easy-to-use and offer loads of interesting and dynamic communication functionalities. The total time spent on social media across PC and mobile devices continues to increase at phenomenal speed. As such, it has become a fundamental platform for search engine marketing, search engine optimisation and digital campaigns. For content contributors (in other words, anyone participating on social media platforms), the benefits have gone far beyond simply social sharing and communication, to building reputation, visibility, credibility, creating news, career opportunities, and various forms of monetary income. Essentially, social media has become a hub for sharing personal information, as well as business related content - an ideal avenue to further promote and expose brands, products/services and news; using content based (free) PR, and paid advertising. Of course social media is by no means limited to these above. Each year, many new platforms appear. You should always evaluate which are best suited to your website's purpose and focus on building network and exposure via these. Social media at its purest refers to the means of interactions among people in which they create, share, and/or exchange information and ideas in virtual communities and networks, i.e. online. Andreas Kaplan and Michael Haenlein define social media as "a group of Internet-based applications that build on the ideological and technological foundations of Web 2.0, and that allow the creation and exchange of user-generated content." Furthermore, social media depends on mobile and web-based technologies to create highly interactive platforms through which individuals and communities share, co-create, discuss, and modify user-generated content. It introduces substantial and pervasive changes to communication between organisations, communities, and individuals. When social media is used in combination with mobile devices it is called mobile social media. This is a group of mobile marketing applications that allow the creation and exchange of user-generated content. "Social media has completely changed the way SEO and digital marketing is being conducted. It has provided everyone the opportunity to compete on level playing fields. Although hyperlinks from social media do not actually benefit search engine ranking (like back-links on other relevant and credible third party website do), it is still a great tool for generating traffic back to your website, for building general brand and website exposure, as well as for promoting information exchange and interaction." SEO Testing Test your website's search engine ranking & characteristics to know where you stand. Test your website's search engine ranking & characteristics to know where you stand. When building a website, all aspects need to be tested: front-end navigational logic; CMS usage; and all types of functionality bugs. By the same token, SEO should be tested - evaluating the website's ranking in major search engines; position, which key words and phrases are driving search ranking results, how search results appear (i.e. titles and descriptions), as well as monitoring and analysing existing traffic and behaviours. Make sure your website is ranking where it should be, with the targeted key words and phrases, and appearing as best it could be with proper titles and descriptions. Of course many strategies and techniques should be adopted to achieve this early on during the construction phase of your website, i.e. business sector and market research, content copywriting, meta tags, back links, SEM, and digital marketing campaign - building solid SEO foundations. However, subsequent (on-going) effort is also required, both in the same areas of content-related, as well as in other ranking testing areas. These will increase your chances of appearing higher in search engines and in a greater variety of search key words, terms and phrases. It will also confirm search rankings and drive future results. Sound a little confusing and vague? Speak to Web-Conceptions for an SEO review and more precise consultation. Search engines like Google, Yahoo and Bing monitor the relevance of their search results in order to improve their own technical abilities and efficiencies, ultimately enhancing their search engine service. Hence, in stands to reason that tracking and monitoring website traffic and testing search results are not only vital for improving website performance, but also for boosting search engine ranking. "Because we've established ourselves as more of an international web development team, with networks and contacts in key markets worldwide, we are in a unique position to test SEO from a range of countries and offer a true indication of what's happening - what Google Australia reveals in search results can many times be different to Google UK, Google France and Google Cyprus. At the same time, this puts us in good stead to test and optimise." Analysis Understand your website audience & their surfing behaviours to help improve the experience. Understand your website audience & their surfing behaviours to help improve the experience. Once you've built a website, it's not good to just sit there and be inactive, thinking that it will start doing all the work and bring in the rewards. Only 50% of the work is actually done during the website construction phase; the rest is ongoing maintenance. Thus, you must pay constant attention to what's going on and adjust accordingly in order to boost your website's performance; monitor website traffic and improve. Be proactive, maintaining and adding new content, sending out newsletters, SEM and paid online adds, social media marketing, building online relationships and back links, blogging, etc. Plus many more in-depth web-stats and a real-time analysis of the visitors to your website, presented with visuals, graphs, tables & links. "Knowledge is power. Understanding your customer in any sort of business/organisation is fundamental in delivering a better service. The same applies to website traffic. Monitoring and understanding web traffic behaviour helps you make good decisions to become more successful online."